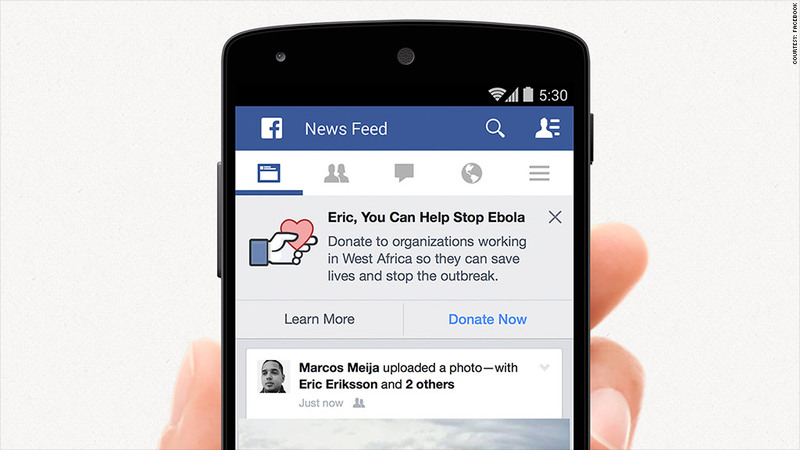 Facebook is launching a fundraising campaign to help groups fighting Ebola. The social network, whose founder Mark Zuckerberg announced a personal $25 million donation to help battle the deadly disease, will make it easier for others to donate as well. But while Zuckerberg and some other billionaires and companies have made some big donations, small donations from the general public have lagged far behind the $1 billion the United Nations estimates it will take to fight the crisis. Zuckerberg's donation went to the Centers for Disease Control Foundation. But Facebook is seeking donations for three other groups: the International Medical Corps, the International Federation of Red Cross and Red Crescent Societies and Save the Children. Facebook's 1.3 billion users will see a message at the top of their news feed with an option to donate to those groups. The company will also team with UNICEF to provide information through Facebook to people in targeted regions about Ebola symptoms and treatment. Additionally, it will team with NetHope to provide communications services to medical and aid workers in Guinea, Liberia and Sierra Leone. "In times of crisis, people turn to Facebook (FB) to learn about what's happening, share their experiences and offer support," said the company's statement. "If not addressed, the Ebola epidemic could become a long-term global health crisis. Together with our partners, we're hopeful that by offering people the tools they need, we can all help fight this disease." More information on its efforts is available at facebook.com/fightebola.